I already covered Alan Benes, so I am out of Benes posts after this one. 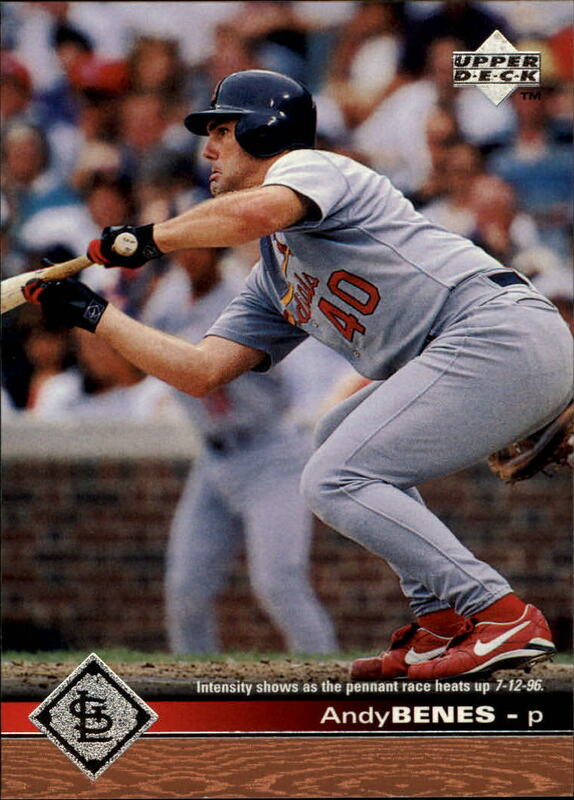 The Cardinals signed Andy Benes as a free agent prior to the 1996 season. He had ended the 1995 season with the Mariners, but had previous played seven seasons with the Padres after they selected him first overall in the 1988 MLB Draft. Benes was decent with the Padres. He threw hard, ate up a lot of innings, and got a decent number of strikeouts. 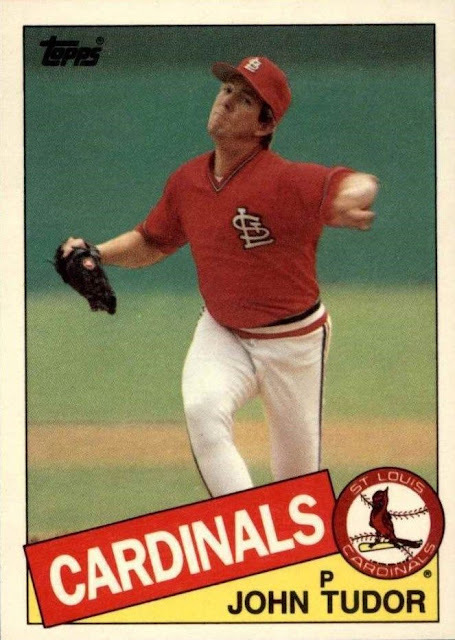 The Cardinals signed him for two years as a part of their team makeover, which included hiring Tony LaRussa, and trading for half of the Oakland A's. -Tudor went 1-7 too, but ended up 21-8. -Benes had an ERA of 5.92 and a record of 1-7. Not very good. -Tudor had an ERA of 3.74 and a record of 1-7. He was always a pretty good pitcher. -Benes had 17 games after a 1-7 start where he gave up 2 runs or fewer. -Tudor had 20 games after a 1-7 start where he gave up 2 runs or fewer. Again, Benes had a good run the second half of the 1996 season, but still not the same as Tudor had in 1985. Both pitchers did manage to get their teams into the Postseason. Tudor got the Cardinals into the World Series against the Royals, the team lost in seven games, while Benes got the Cardinals to the National League Championship Series. The Cardinals lost that to the Braves in seven games. 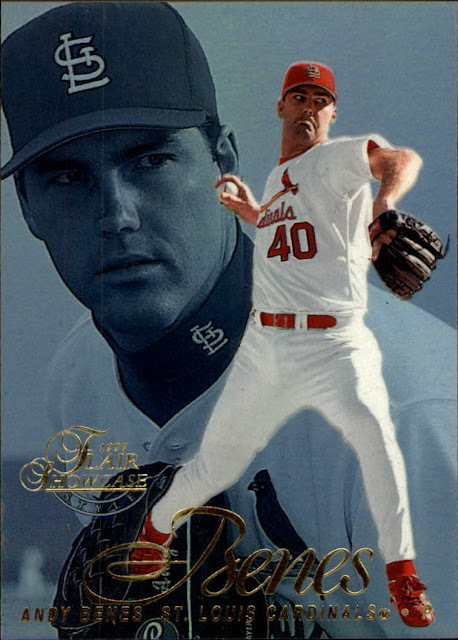 Benes had some nice cards during his first season on the Cardinals. My favorite card is his 1996 Leaf Signature autograph. There were a good deal of Cardinals in this set. A few were a little odd, like Rick Honeycutt and Mike Gallego. I thought of Benes as being more of an actual Cardinals player with a card in that product. 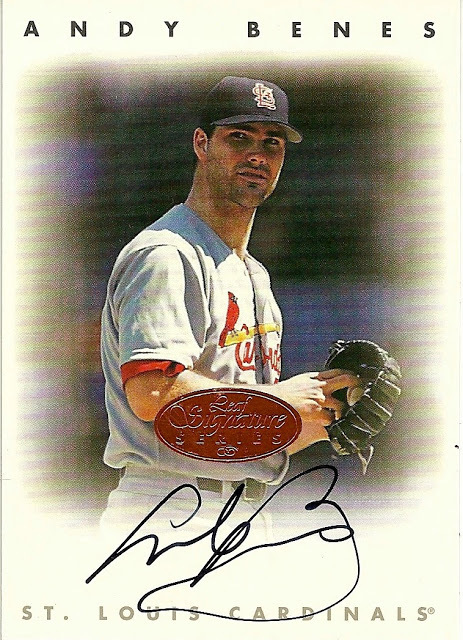 I am not going to be saying much about his second run with the team, which was in the early 2000s, but I think that it contributed to this being a card that I enjoyed having in my collection. My favorite Cardinals card in the Leaf Signature set is still either Pagnozzi or Brian Jordan. Alan Benes was a pretty big prospect for the Cardinals in the mid 1990s. The team brought him up at the end of the 1995 season and stuck him into the rotation at the beginning of the 1996 season. I am not sure how many dual cards there were of Andy and Alan, but this one is pretty nice. The Fleer set from 1996 is one of my favorite. Not flashy, not expensive, or limited in anyway. It's a really simple design with some really good pictures. I like this picture of Benes. It is a really good representation of what he was as a pitcher. He was big, much more of a thrower than a pitcher, and there were always a ton of sliders. 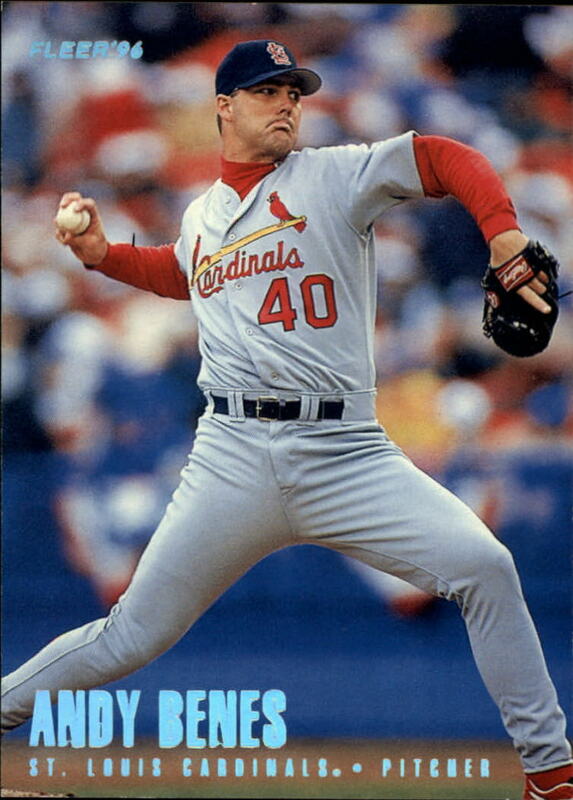 The 1997 season was not kind to the Cardinals, but Benes had one of the better years of his career. In all, he went 10-7 on a really mediocre team and averaged almost a strikeout per inning. At the end of the season, the Cardinals and Benes tried to work out a new contract, but missed the signing deadline which used to exist for players to return to their current team. His contract was voided. Many Cardinals fans were upset that Bud Selig voided the contract in light of his team, the Brewers, moving into the National League Central with the Cardinals that offseason. Benes ended up signing with the Diamondbacks. 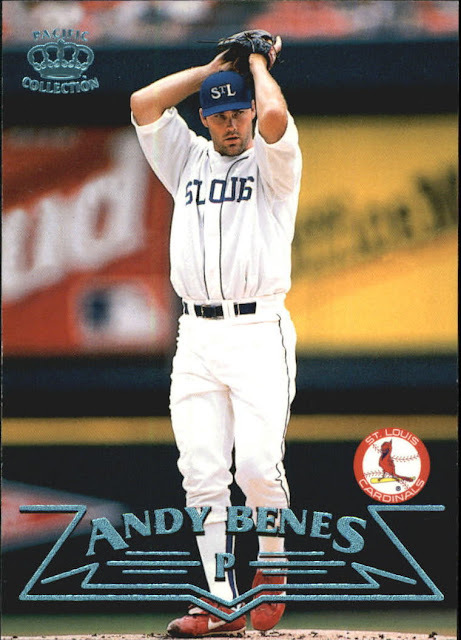 Over his final season with the Cardinals, there were a few more nice Benes cards. 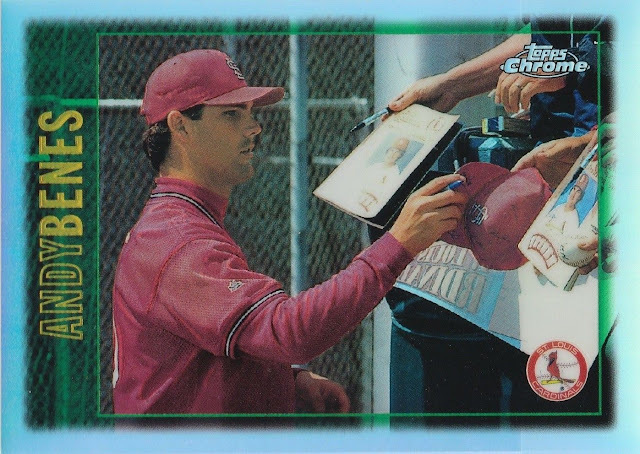 His 1997 Topps, or Topps Chrome. Same card, different finishing touches. His 1997 Upper Deck card. Pretty intense look on his face, the Wrigley back drop helps, and every body a card where there is a pitcher hitting. is a Flair Showcase. A high end card is always nice. I really like the color photo overlaid on top of the black and white photos on these cards. Really nice look. Anytime you can find a piece of cardboard with a player in a throwback uniform of any kind, it is usually a really card. This Benes card is no different. The lines around his name sort of block out the socks, but they are the real baseball socks with stirrups. 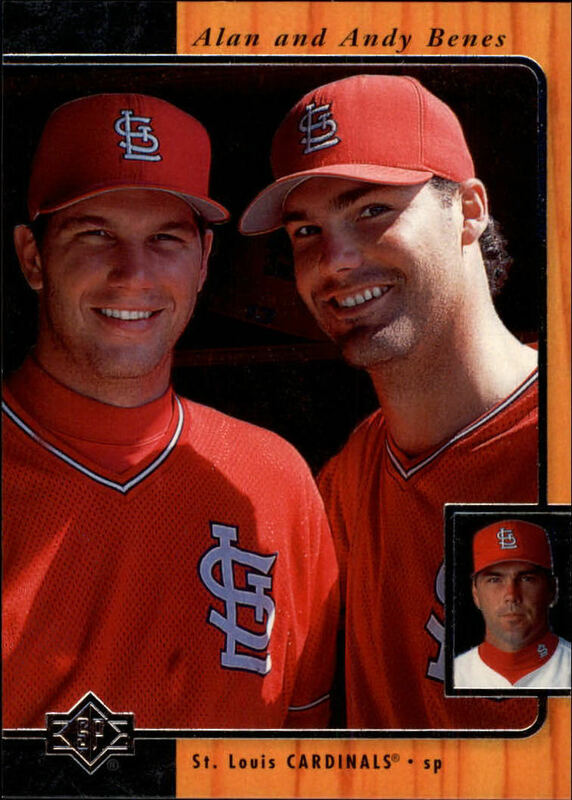 Pacific made half of their Cardinals sets in 1998 from whatever game they wore these St. Louis Starts uniforms. That SP Benes brothers card is pretty cool. I remember Tudor more than Benes. Something about those 80's Cardinals teams that I loved. It was almost like I was a closet Cardinals fan back in the day. This is a great series! So many compelling cards and players. Sorry, I was the unknown. No idea why I wasn't signed in!